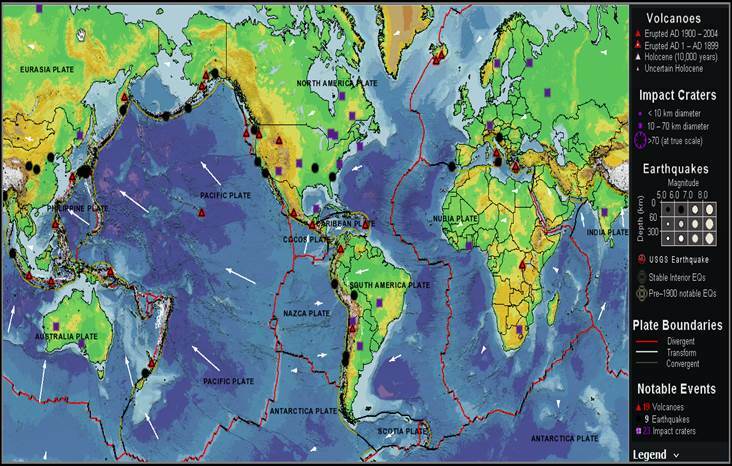 Global Volcanoes, Impact Craters, Earthquakes, Plate Boundaries and El Salvador Volcano Eruption Photo. | Chaos Sweeps Away the World We Know! The Disaster, current events & Catastrophe Blog. Forecasts for 2014 to 2022. Read tomorrows news today! Plus current economic, commodities, stock indices and financial news. ← Wintry Wanderings Among Chelsea’s Ghosts. December 30, 2013 – This Dynamic Planet: The map above show global volcanoes, impact craters, earthquakes, plate boundaries and notable events, i.e., 19 volcanoes, 9 earthquakes, and 23 impact craters. Once you click on the link below, the slider along the left enlarges and shrinks the image. The “Layers” down arrow in the upper left controls what you want on the map, i.e., any of the items described in the first sentence above. (Credits – The Smithsonian Institute). Update: A volcano erupted in eastern El Salvador (above) on Sunday morning sending thousands of people fleeing the area. Residents in the coffee-producing region said they had heard a powerful explosion before the Chaparrastique volcano began spewing hot ash and smoke into the air. No one has been hurt, say the authorities. Anyone living in a 3km (2 mile) radius will be evacuated. Civil Defense Director Jorge Melendez said a yellow alert had been issued and investigators had been sent to the area to look for signs of fresh lava, but that none has been detected so far. “We have implemented emergency measures to evacuate villages located within 3 kilometers of the volcano,” Melendez said. Temporary shelters are being set up in the area. Civil protection authorities say that some 5,000 people live in the area, in San Miguel province. The eruption began at 10:30 local time. The Salvadoran government says it had been monitoring the situation since 13 December, when they detected increased activity inside the volcano. 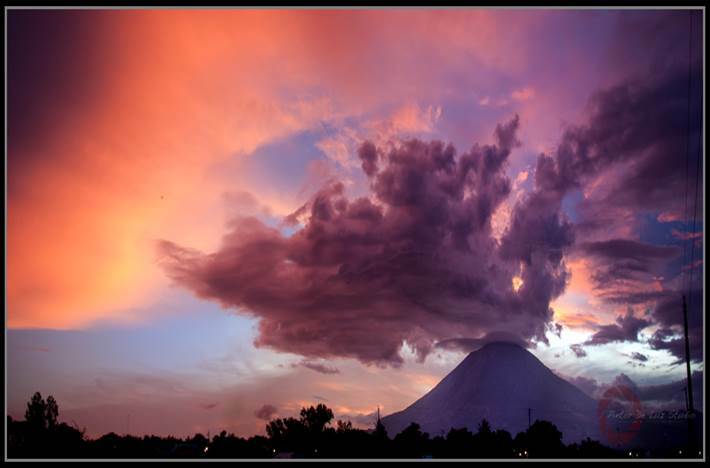 There are more than 20 volcanoes in the small Central American nation. At 2,129 meters (7,000 ft) above sea level, Chaparrastique is the third highest volcano in the country. It is located about 90 miles (145 kilometers) east of San Salvador, the capital. Its last significant eruption was in 1976. It also caused a strong tremor in the area in 2010. (Credits – RSOE EDIS and Pintor De Luz Studios). This entry was posted in Disasters, Earthquake, Volcanoes and tagged Central America, Chaparrastique, el salvador, Jorge Meléndez, San Miguel, San Salvador, volcano. Bookmark the permalink. 1 Response to Global Volcanoes, Impact Craters, Earthquakes, Plate Boundaries and El Salvador Volcano Eruption Photo.